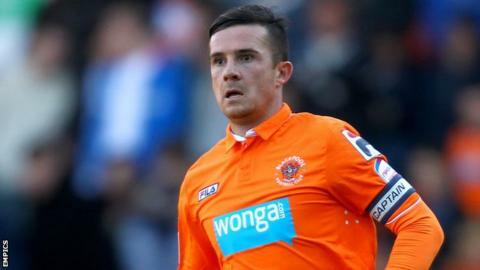 Fleetwood have signed former Scotland captain Barry Ferguson on loan from neighbours Blackpool until 1 January. The 34-year-old midfielder has made seven appearances for the Seasiders this season, the last coming on 6 October in a 2-0 defeat by Charlton. And the former Scotland captain is disappointed with a lack of first-team football at Bloomfield Road. He will be eligible to face Blue Square Bet South side Bromley in the FA Cup first round on Saturday. Ferguson's move comes at a time when the future of Blackpool manager Ian Holloway appears unclear, with to speak to the 49-year-old about the vacancy at Selhurst Park. Fleetwood manager Micky Mellon told BBC Scotland: "Everybody knows Barry Ferguson is still a top footballer and will have a great impact both on and off the pitch for us. "He himself will tell you if you spoke to him that he was turned on by what's happened at Fleetwood in the past seven years, when we've had five promotions and we believe that, with the ambitious chairman we've got, the story is not over yet. "We saw the opportunity with our near neighbours, Barry wasn't playing and wanted to get some first-team football and I know Barry personally and I'm good friends with Ian Holloway." Fleetwood, who in the summer, are currently fourth in League Two. After Barton had trained with the Cod Army for several weeks, their bid to sign the one-time England international failed and he eventually joined French club Marseille at the end of the transfer window. But the arrival of Ferguson, who won 45 caps for Scotland and captained Rangers to a Uefa Cup final in 2008, represents a major transfer coup for the Football League newcomers. Chairman Andy Pilley told the club website: "Barry is a massive signing. "His footballing credentials are second to none and this is a huge, huge day for Fleetwood Town." Ferguson, who had spells in the Premier League with Blackburn Rovers and Birmingham City, joined Blackpool in July 2011 following their relegation from the top flight. He played 45 times for the club in 2011-12, including their play-off final defeat by West Ham at Wembley in May.